Add a splash of sound with the Splash SoundBox. 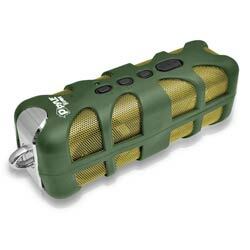 This Marine Grade Speaker comes equipped with Bluetooth wireless technology and brings audio wherever you go. Easily stream and play music from virtually any Bluetooth enabled device quickly and easily – that includes your smartphone, MP3 player, tablet, computer, etc. Rugged splash proof and shock resistant design makes this portable speaker perfect by the pool, visits to the beach, hiking and just about any outdoor activity. Features include built-in rechargeable battery, easy-push button controls, impressive bass output and plenty more to add some audio to any occasion. >> The PWPBTA70 versions includes a 3.5mm / 1/8 aux input where as the PWPBT60 versions does not.